For former New Yorker Bernadette Jean-Francois, moving to Charlotte was a welcoming change of pace. "I was working full-time, going to school at night, having children. It was getting expensive," she recalls. "My family said, 'Let's explore a different location,' and we fell in love with Charlotte." Still, something was missing for Haitian-born Jean-Francois: the taste of home. Though Caribbean cuisine had carved out a niche in New York, Jean-Francois realized it was harder to find in the Queen City. In an attempt to fill the void, Jean-Francois joined her sister-in-law, Edith, in opening a Caribbean takeaway. Though the to-go shop eventually closed, it planted the seeds for a bigger vision: "I said, 'Let's do something more elegant, something nice where people can sit down and we play music and have a live band.'" 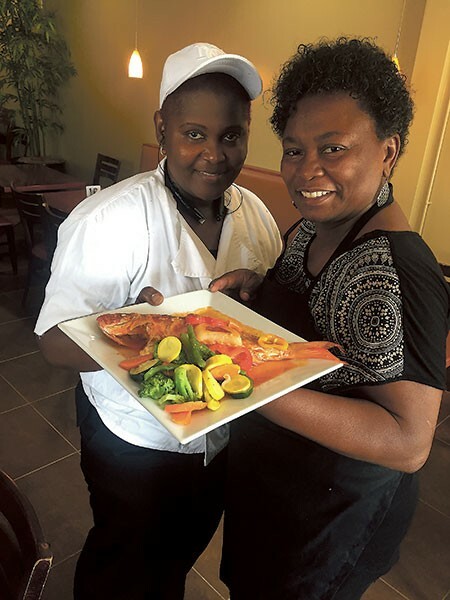 Jean-Francois' vision of a creating a Caribbean flavor that transcends the menu got traction when her husband found a vacant spot on Monroe Road. Joining forces again with sister-in-law Edith, Bernadette opened Island Hub. Creative Loafing: How did you bring elements of Caribbean nightlife to Island Hub, and what sort of experience did you create? Jean-Francois: We have a live band every Friday night. We have a DJ who plays all different types of music — Caribbean, Zouk, reggae. Sometimes we have Latin music and salsa. It's been great. We're open until two a.m., and we serve food until the last minute. People come in after two still wanting food, and I say, 'No, I'm tired, I want to go to sleep.' But people can buy food up until two in the morning. The soccer [game broadcasting] has been huge, too. How do you introduce Haitian food to someone that has never tried it before, and what's a good entry-level dish to try? We have a lot of the same culture as New Orleans. We're a melting pot of different areas. Cuban, Islanders, Dominican, Latino... that kind of culture. We mix a little bit of the West Indies. That's why people from Florida are familiar with the food and they look for it. We had a guy from Miami who had been looking for this food forever and was depressed that he couldn't find it. He came here jumping for joy when he saw we serve goat. He said, 'I'll see you every single day!' and he has been! We have a lot of flavor, a lot of spicy. Our traditional griot is major. It's a fried pork. Or legume. That's a famous dish. It's beef braised with eggplant, cabbage, carrots, chayote, spinach and carrots all mushed together. It's great with white rice. If you're into seafood, try the red snapper fish. What inspired the recipes you chose for your menu? I learned to cook from family. I was always a great cook; entertainment was always at my house. When I cook for family, I cook the same things we have here. I had to narrow the menu down because it was getting too big and I wanted the cook to be comfortable. I have my sister-in-law and some good people here, and we team together to provide a good experience. When we get the service right, then I can add little things on top. Make some surprises, so people don't get bored with the same food. I'm big on customer service, and I want to get good people in here. When you come here, you're like family. We have a very friendly environment, all about love, we want to share that love through food. Everybody's welcome, not just people from the Caribbean. All races, all colors, everyone comes here and they enjoy it and they're very happy about.